It can be hard enough choosing your wedding dress… So, how can you decide which veil is the perfect one for you and your dress? This is a once in a lifetime that you will probably wear a veil, so it is important to try them all and see which one you love the most. You just feel right, you just know as soon as you put on your dream dress! And sometimes the veil is the finale to the dress hunt. Once you put the veil on you feel like a bride. Your dress assistant advise you on the length of your veil. That means finding a style that complements your overall silhouette- you don’t want your veil to interrupt the flow of your look. Shorter veils, like bandeaus, birdcages and blushers, tend to lend a bit more personality as well as an informal or retro edge to your look. Longer veils (ballet, chapel and cathedral styles) lean more towards tradition and formality. If your wedding dress is heavily embellished, keep your veil on the simple side, with minimum extras. Try to create a balance as well when it comes to embellishments. 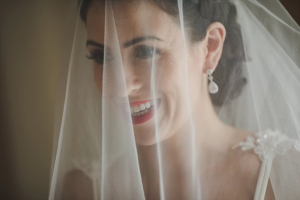 Before you decide on a veil, its smart to have some idea how you will wear your hair and Makeup on your wedding day – the style you choose may affect your final veil decision. Halo veils, bridal caps and mantilla veils work really well when your hair is worn down or low messy updos, while blushers and birdcages are much more versatile. Your hairstyle may also affect where you place the veil and how you secure it. If you are wearing your hair up, you can wear the veil above or below the bun or up style. Your veil can go above the bun this gives it more volume and achieves a more classic look while placing it below feels more modern. When you have purchased your veil try to take it along to your makeup and hair trial. For me…. 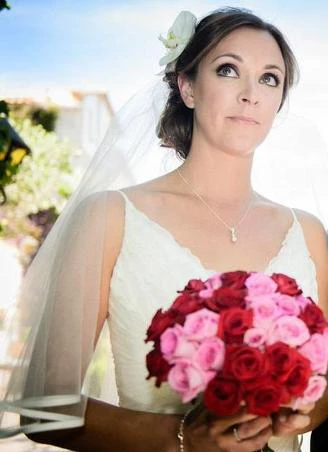 The best moment is attaching the veil once I have the bride ready with makeup and hair.